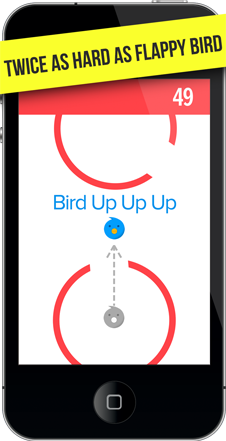 Tap to flap your bird. Dodge your way out of a circle. Get back in another circle. Jump your way through the obstacles. Don't touch the black objects. The gray objects are ok.
Do you like word puzzle games? 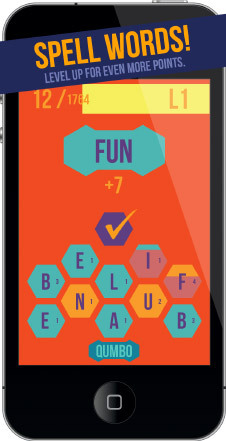 See how far you can go in one of the most addictive single player word games on the planet! Use the tiles to create words and earn your best letter score. The more letters you use, the higher your word bonus. And as you level up you earn even more points! But watch out! Each tile has a timer. If even just one tile goes completely red -- you're dead. Use those tiles first before time runs out! Select your tiles to make your words. Push the check mark to submit. To subtract a letter, just push the word you've created. Bacon Farts FREE! Yes, cheapskate, a free fart sound app! Save your cash for something important, like a good education or a new boat. We aren't going to make you pay to play fart sounds! Just turn the dial to change the pitch! Featuring Classic, Thanksgiving and Christmas theme packs with 76 awesome fart sounds and the awesome fart bender button, you'll be in total control of your fart sounds. You've seen Brooklyn Decker use it on Adam Sandler in Just Go With It! You've also seen Leo LaPorte review it on TWIT.TV! Now enjoy it for FREE! ...and many more bacon themed fart sounds! You love bacon farts. I love bacon farts. We all love bacon farts. It's an app. It's a way of life. Comes in dozens of styles and colors! Show your love. Get the shirt. Like the free version? Then you'll love Bacon Farts without all of the advertising. Enjoy Bacon Farts the way nature intended. Endless fart sounds and combinations from one awesome app. Practice your technique for even better results! It's like getting a million farts in one dirt-cheap app! 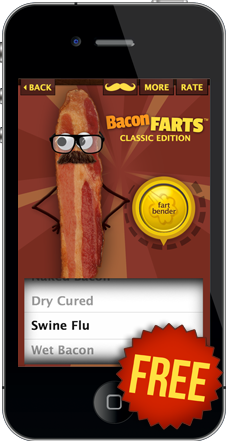 You've seen it on CurrentTV, now get the whole collection of fantastic fart sounds with a delicious bacon theme! 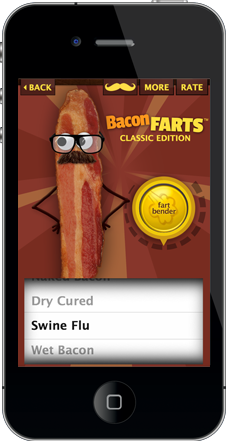 "I highly recommend using the bacon farts app while in the airport bathroom. Immature? Yes. Hilarious? 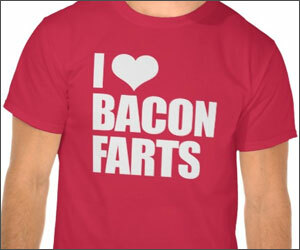 Yes"
If you love bacon farts, you're just as big of a fan about plain old bacon. 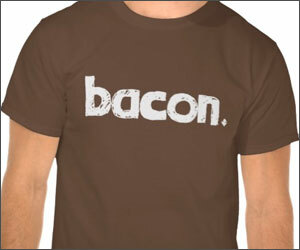 Here's a plain old bacon shirt. Comes in dozens of sizes and colors. Get the shirt. 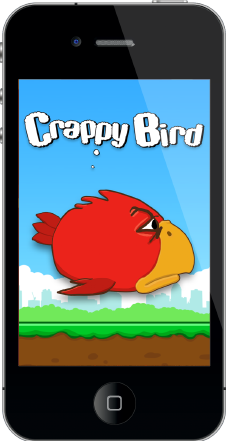 A parody of the now famous flappy flier, this version adds a little poo humor into the fray. This flying bird game challenges you to fly through difficult rocky passages for as far as you can without smashing into the rocks. As you play, the rocks get more and more challenging. Flapping makes Crappy Bird fly higher. With one-touch flap action to fly, this flying flappy game brings it's challenges and even a few laughs. How high can you get your score? 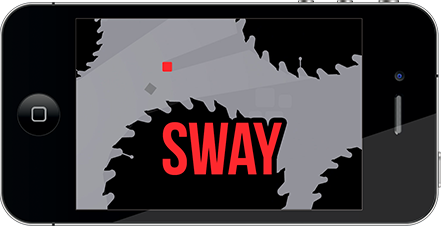 Similar to the famous "Flappy Bird" -- you'll be flapping your way to frustration in no time! 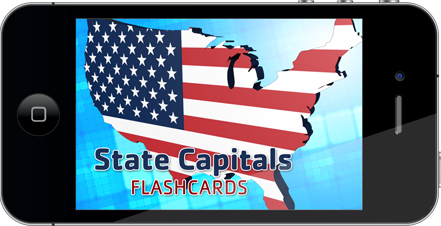 Learn your state capitals quickly, with this handy flashcard app. Touch and hold for the answer. Swipe left or right for previous or next flashcard. Easily switch between state view or capital view, to help you learn them both! Plus you can learn them in alphabetical order, or shuffle the cards to really test your skills. 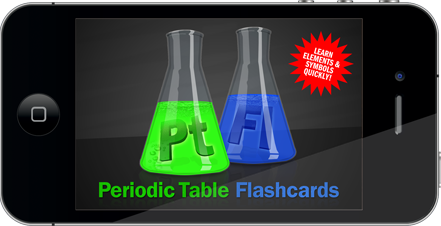 Learn your periodic table element names and symbols quickly, with this handy flashcard app. Touch and hold for the answer. Swipe left or right for previous or next flashcard. Copyright ©2012 Focal Point LLC – All right reserved.